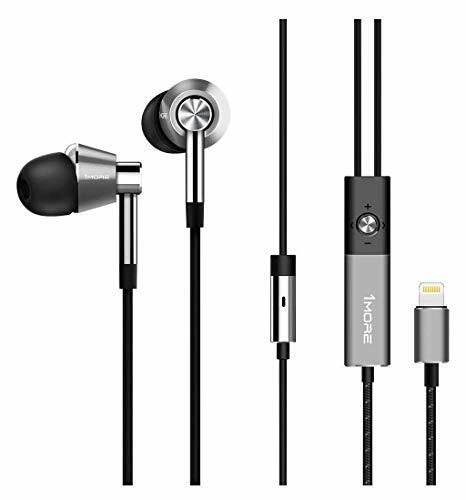 With the market being flooded by what are essentially different color variants of the same crappy lightning cable earbuds it is getting confusing for audio lovers to differentiate between fly-by-night schemes and good, honest consumer audio brands. Luckily for you, the reader, the nerds at Lightningcans.com have no lives (outside of Reddit and scrabble with our mothers) and have sifted through all the scum of the web to find you a truly amazing pair of top-quality earbuds, that, wait for it… feature triple driver construction! Wait, is this another fly-by-night electronics company with no real website run by some one-eyed pirate out of China? No, it is not. 1More is a consumer electronics startup based out of San Diego California. The Triple Drivers have already won a fair share of awards, earning them considerable “street cred” in the audio world. Yeah, ok, American, cool, but there are tons of lightning cable earbud options out there, what’s so different about these? Well, in case you missed the news flash, these are the first set of buds that have 3 drivers inside them, which can make full use of the pure hi-res signal transmitted via the lightning connection. This means the Triple Drivers can hit frequencies between 20-40,000 Hz, which you will be hard pressed to find with other buds at this price. The 1More’s each contain 2 armatures, which are essentially the “tweeters” of the earbud, and one dynamic driver to back the armatures up with full mids and rumbly lows. Many earbuds only have one driver, which is tasked with the responsibility of reproducing lows, mids and highs. Often times, at least with sub $300 models, this is simply too much to ask of a single driver. Besides the fact that these little fellas each have 3 drivers in each “bud” (totaling 6), there is also a 5-In-1 controller that lets you make phone calls, run Siri, adjust volume and change tracks without having to take your phone out of your pocket. 1More also offers a free app you can download that can help you to optimize the microphone quality via your Triple Drivers. The design of the buds themselves is kind of an industrial-minimalist motif, with nice lightweight sandblasted finger-print-proof aluminum alloy for the housing, oblique angled silicon ear fittings for a tight fit, and a strong kevlar-cored cable for long strength. The outside of the cable is further beefed up with thermoplastic elastomer and a final layer of braided nylon to help fight the dreaded “tangles”. The cherry on top of all of this is the fact that these earbuds were developed and “tuned” by a Grammy winning sound engineer, Luca Bignardi, for perfect response no matter what type of music you listen to. A very unique, and if we must say, scholarly packaging design. Bravo sirs. All Triple Drivers also come with 6 sets of replacement silicone tips of varying sizes for a perfect fit, 3 sets of foam ear tips if that is more your cup of tea, a magnetic closing travel case, a beautiful storage case/housing, a dual prong airline adapter for the travelers and last but not least, a shirt clip for those who prefer to take their buds to the gym. At a suggested price of $149.99 for the lightning version of these buds, factoring in all of the features mentioned above, and the simple and time-tested aluminum housing+kevlar cable design, we think 1More has a real winner on their hands with these. As a consumer, you would be VERY hard pressed to find a better balance of quality and value! One thing we are curious about though, is whether 1More plans to port their “Quad Driver” earbuds over to a lightning-connection anytime soon…as they also look absolutely stunning! If you own a pair of Triple Drivers, let us know in the comments what YOU think of them!